The Cincinnati Reds visit Miller Park on Tuesday, September 26, 2017 to play the Milwaukee Brewers. The probable starters are Deck McGuire for the Reds and Zach Davies for the Brewers. The opening line for this matchup has Cincinnati at +135 and Milwaukee at -145. The Reds have a 80-71-5 over/under record and a 79-77-0 run line mark. The Brewers are 83-73-0 against the run line and have a 66-83-7 over/under record. The Reds have a 66-90 overall record this season. Starting pitcher Deck McGuire has a 0-0 record with an earned run average of 0.00 and a WHIP of 0.35. He has 4 strikeouts over his 5.2 innings pitched and he's given up 2 hits. He allows 3.2 hits per 9 innings and he has a FIP of 2.27. The bullpen has an earned run average of 4.66 and they have given up 557 base hits on the year. Teams are hitting .246 against the bullpen and they've struck out 571 hitters and walked 267 batters. As a team, Cincinnati allows 9.1 hits per nine innings while striking out 8.2 batters per nine innings. They are 29th in the league in team earned run average at 5.21. The Reds pitchers collectively have given up 1,399 base hits and 799 earned runs. They have allowed 243 home runs this season, ranking them 1st in the league. Cincinnati as a pitching staff has walked 607 batters and struck out 1,257. They have walked 4 men per 9 innings while striking out 8.2 per 9. They have a team WHIP of 1.45 and their FIP as a unit is 5.10. As a team Cincinnati is hitting .253, good for 18th in the league. The Reds hold a .433 team slugging percentage and an on-base percentage of .329, which is good for 12th in baseball. They rank 19th in MLB with 8.6 hits per game. Joey Votto is hitting .317 with an on-base percentage of .452. He has 171 hits this season in 539 at bats with 96 runs batted in. He has a slugging percentage of .571 and an OPS+ of 167. Adam Duvall is hitting .244 this year and he has an on-base percentage of .296. He has totaled 139 hits and he has driven in 97 men in 570 at bats. His OPS+ is 98 while his slugging percentage is at .477. The Reds have 1,335 hits, including 237 doubles and 213 home runs. Cincinnati has walked 550 times so far this season and they have struck out 1,274 times as a unit. They have left 1,091 men on base and have a team OPS of .762. They score 4.69 runs per contest and have scored a total of 731 runs this year. Milwaukee has a 82-74 overall mark this year. With an earned run average of 3.84, Zach Davies has a 17-9 record and a 1.34 WHIP. He has 124 strikeouts over the 187.1 innings he's pitched. He's also given up 198 hits. He allows 9.5 hits per nine innings and his FIP stands at 4.12. The bullpen has an earned run average of 3.86 and they have given up 492 base hits on the year. Teams are hitting .238 against the Brewers bullpen. Their relievers have struck out 585 batters and walked 260 opposing hitters. As a team, Milwaukee allows 8.6 hits per nine innings while striking out 8.4 batters per nine innings. They are 8th in the league in team earned run average at 3.98. The Brewers pitchers as a team have surrendered 1,335 base knocks and 616 earned runs this season. They have given up 176 home runs this year, which ranks 26th in Major League Baseball. Milwaukee as a staff has walked 535 hitters and struck out 1,297 batters. They give up a walk 3.5 times per 9 innings while they strike out 8.4 per 9. Their team WHIP is 1.34 while their FIP as a staff is 4.22. As a team, they are batting .249, good for 21st in the league. The Brewers hold a .431 team slugging percentage and an on-base percentage of .321, which is good for 19th in baseball. They rank 22nd in MLB with 8.4 hits per contest. Orlando Arcia comes into this matchup batting .270 with an OBP of .320. He has 132 hits this year along with 49 RBI in 488 AB's. He maintains a slugging percentage of .406 with an OPS+ of 88. Domingo Santana is hitting .277 this season and he has an OBP of .370. He has collected 140 hits in 506 at bats while driving in 80 runs. He has an OPS+ of 124 and a slugging percentage of .498. The Brewers as a team have 1,313 base knocks, including 257 doubles and 219 home runs. Milwaukee has walked 521 times this season and they have struck out 1,522 times. They have had 1,045 runners left on base and have an OPS of .752. They have scored 4.51 runs per contest and totaled 704 runs this season. 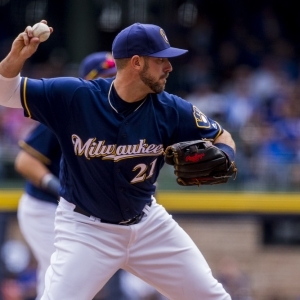 Who will win tonight's Reds/Brewers MLB game against the spread?